The physical mechanism to store data in flash memory is based on storing electrical charge into a floating gate of a transistor. This charge can be stored for extended periods of time without using an external power supply but gradually it will leak away caused by physical effects. Data retention specifications for current flash memory are between 10 and 100 years. re-written. Erasing results in a memory block that is filled completely with 1’s. 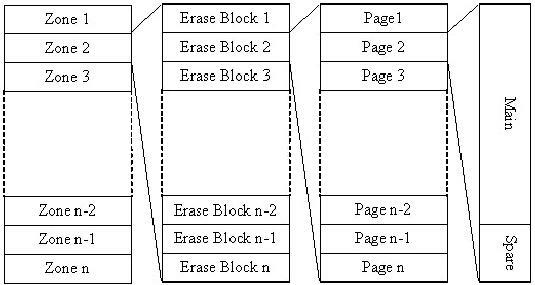 In NAND flash, erase blocks are divided further into pages, for example 32 or 64 per erase block. A page is usually a multiple of 512 bytes in size, to emulate 512 byte sector size commonly found in file systems on magnetic media. Additionally, a page has a number of so called ’spare area’ bytes, generally used for storing meta data. Some flash disk drivers use the concept of zones . 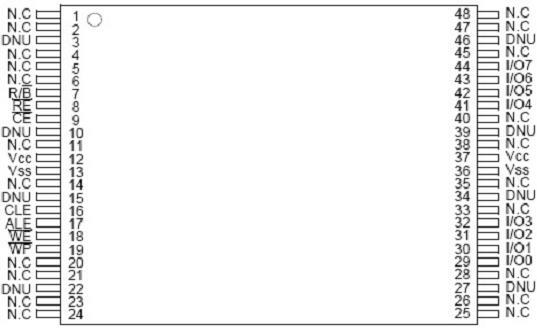 A zone is a group of blocks, usually 256 to 1024. Contrary to blocks and pages, a zone is just a logical concept, there is no physical representation. See figure 1 for a dissection of NAND flash memory. blocks when leaving the factory. In datasheets of NAND flash chips, the guaranteed minimal number of good blocks when first shipped is specified. Typically at least 98% of the blocks are guaranteed to be in working order. Initial bad blocks are marked as such in the spare area. In order to spread the erasing of blocks as evenly as possible over the full range of physical blocks, flash memory vendors have developed so called ‘wear levelling’ algorithms. The idea is that spreading the wear, caused by erasing a block, as much as possible over the whole capacity of the flash memory will increase the overall lifetime of the memory. For manufacturers of memory devices, the wear levelling algorithm can be very sensitive intellectual property, so any inquiries that look like questions about the wear levelling algorithm will often be left unanswered. However, for the reconstruction of data in a flash memory, it is not necessary to know how the wear levelling created the physical image that is copied of a flash chip. All one needs to know is how to recreate the right order of physical blocks in order to create a logical copy of the higher level file system.In other words: wear leveling can be seen as a dynamic process that rearranges pages and/or blocks continuously in order to extend flash lifetime. When trying to interpret a static ‘snapshot’ of the wear leveling process (the exact binary copy of the physical flash memory at one particular moment) no knowledge of the ‘dynamic behavior’ of the wear leveling algorithm is needed. generally referred to as the I/O (Input/Output) lines. This bus can be either 8 or 16 bits wide. An example of the electrical interface of a NAND flash chip is shown in figure 2, with the pin names in table II. Data in the NAND flash chip is accessed by first applying the address of the required data on the I/O lines. 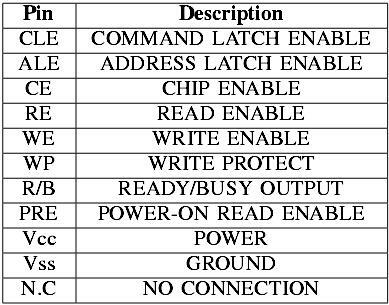 As the highest address is generally higher than can be reached with 8 or 16 I/O line bits, the address is latched into the chip in three to five address cycles. 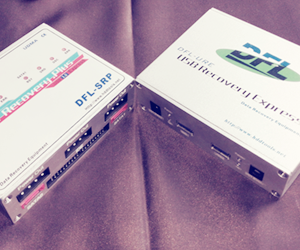 After the address is latched into the chip, the data can be clocked out over the same I/O lines. A typical sequence to get access to data in a NAND flash chip is shown in table III.